My friend Bo sent this to me. It’s a little slow, but someone put a lot of work into these graphics. You can send a postcard from OMSI now: <http://www.omsi.edu/online/> is the page that shows most of OMSI’s online activities (at least the ones that are okay to show right now. I can’t wait until I can put Forest Puzzles up there. While everyone else is getting ready for SXSW, the WebVisions board has been busy getting this year’s edition ready to go. I’m really excited that Jeffery Veen is back. His presentation (5 or so years ago) was one of the best ever and even though we usually don’t have return speakers, Veen is one of the few that I’m truly glad to hear again. Media, technology and consumer trends visionary Lynne Johnson will join WebVisions to deliver the Thursday keynote address. Lynne is the Senior Editor and Community Director for FastCompany.com, a leading website and community for people passionate about business ideas that also offers the complete content of Fast Company magazine. She also writes a technology blog following web, media, and consumer trends for FastCompany.com, and guest blogs for techPresident and Black Web 2.0. An internationally sought-after sage, author, and user experience consultant, Jeffrey Veen will return to WebVisions to deliver one of the eventâ€™s keynote addresses. Currently a Design Manager and project lead for Googleâ€™s Measure Map project, Jeffrey is returning to WebVisions to share his vision for the future of the Web. At this point, WebVisions as an event runs really smoothly. We get a good set of volunteers returning each year, and my Tech Crews are always on top of things. I’m the stage manager and try to make sure that each speaker is prepared and comfortable, the audience is undistracted, and the volunteers understand that the audience members are expecting to have a great experience and we want to give them an outstanding experience. WebVisions is incredibly cheap and for the quality of the speakers and the location, it cannot be beat. I hope you’re coming! The one story-brutalist building that is the front door of what is arguably the most famous retail location in Portland. 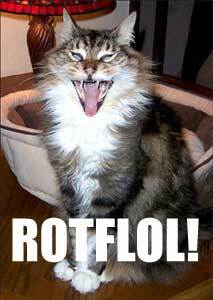 But it’s ugly like yo’ mamma. It’s ugly like this is where they get the ugly books to learn how to make the ugly sticks! Ever since the similarly designed Henry Weinhards production room was torn down to make room for a new (if not entirely beautiful then at least interesting) tower, this has been one of the travesties of West Burnside. That’s not to say that other building in the area couldn’t use a good leveling… (cough Car Toys cough) but this is Powell’s! 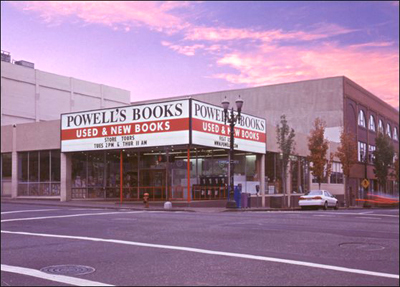 Powell’s did a remarkable job with the opposite corner of their little Kingdom of Books. The 11th and Couch entrance and facade is beautiful, in fact the only real problem with it is that there’s no longer any room around it to enjoy the view. The five story quarter-block was a major upgrade and kept the book store on par with the swanky upturn that the Pearl District was coming out of. I’m sure that this had to be part of a master plan of some sort. The ‘new’ addition at 11th and Couch added a beautiful check-out counter layout with enough slots to hold down the fort while the real front doors are closed down. If Powell’s can make a similar advancement and maybe even a better one, then Portland might get a brand new money-shot to put on the postcards. Com’ on guys, get it right! If you like the products at Design Within Reach you’ll love the video The American Look. It’s a love letter to the mid-century designer… pardon me, “Stylist” with all of the bombastic pronouncements that you might expect from a corporate-sponsored documentary from 1958. It’s just about a half hour long and minutes 26 and 27 are the retro-futuist scenes, but the whole thing is a real Modernist treat. Mini version of the painting of the Newton Apple Cynthia received as a gift from a very special nerd. Limited edition prints mounted on wood, signed and handpainted with stellar bronze paint by the artist herself. Looks awesome hanging on any tech-savvy person’s wall! Well, for an old-skool Apple Fanboy like myself, there was a built-in draw to the device, but even beyond that, this goes much further into the realm of ‘tech from the future’ than any device that I’ve had the dubious pleasure of using. Palms, WinCE/PocketPC, Psions, Nokias, Sony Ericsson… You name it, I’ve probably used it and read about it and wondered “wow, if only…” about it. The iPhone is perfect for me: I do a lot of mail checking and use the web for reference-checking. I’ve got a decent library of music (now with covers) so it’s nice to have a slice of that around. The Phone works just fine, though the $60/month is a bit nerve wracking. Also, I’m in a metro area with really decent coverage by AT&T’s cell service, and though Edge connections are slow, the WiFi makes up for it in the 90% of the time I’m at a place that I’ve set up WiFi: Home and Work. Let’s put it this way: It’s the first cell phone worth criticizing, to paraphrase Alan Kay on the Macintosh. Another thought: Apple’s iPhone commercials simply show the phone being used and demoed. I’m not sure I’ve ever seen a more realistic presentation of a product in television advertising. A view of the edifice from further up the valley. A snow flurry was rapidly closing in. Only a moment before the view was clear. Just after this shot, it was obscured. I don’t always agree with the ideas presented but they are always thought provoking. Mandership by Artemy Lebedev has an average of a post per month and they are qute enjoyable. A nice one recently was in regards to single-dimension scaling of type, where the rule of thumb presneted was to stretch the type along with an image, suggesting the Mona Lisa was a good one. The article has a Flash demo that shows how this works. Nicely done. It’s fun seeing the design issues pointed out in a language I can’t read, and often using characters that I rarely see elsewhere.